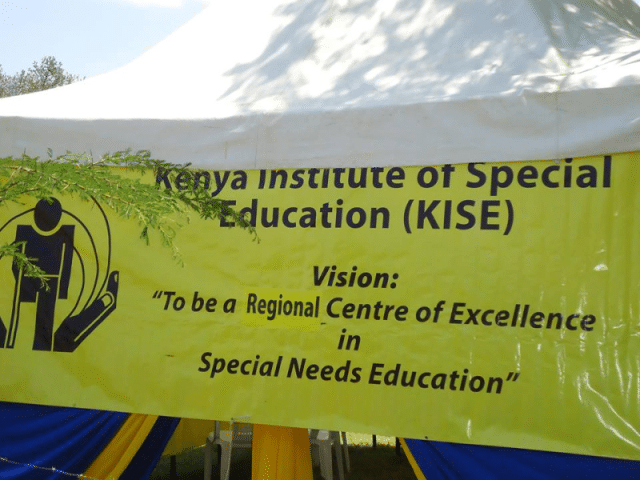 The Kenya Institute of Special Education (KISE) which is a semi autonomous government agency of the Ministry of Education in Kenya, was established on 14th February 1986 through a Legal Notice No. 17. The School is headed by Director who is the Secretary of the Council appointed by the Cabinet Secretary for Education to run the Institution. The Kenya Institute of Special Education wish to invite applications for the admission of Diploma in Sign Language Interpretation and Diploma in Special Needs Education through their distance learning program. A mean grade of C Plain in KCSE or its equivalent with a C plain in both English and Kiswahili. A certificate in Kenya Sign Language proficiency at an intermediate level or its equivalent from a recognized institution. In lieu of or, where necessary, in addition to a certificate as stipulated in item 2, satisfactory performance in KSL proficiency interview conducted by the Implementing Institution. A mean grade of C Minus in KCSE and a minimum grade of C Minus in English or a pass an English proficiency test administered by the implementing Institution. C Plain in Kenyan Sign language at KCSE. Applicants should holders of PI certificate by training or P1 by promotion through the Teacher Proficiency Course. Note: Students undertaking the Vision Support Teacher Course pay an additional Ksh 2000 for Practical Attachment. In addition to tuition fees, each student will meet expenses for medical needs, stationary, accommodation, and transport to the learning venues. The table below shows the tuition fees for each course. Note: The fees shown below are subject to revision from time to time.